Lulla, V., Merits, A. and Lulla, A. (2014). IFN-α/β Detection Assay Using Sensor Cell Lines. Bio-protocol 4(10): e1130. DOI: 10.21769/BioProtoc.1130. Type I interferons (IFN-α/β) play an important role in host resistance to viral infections. Signaling through the JAK-STAT pathway, IFN-α/β stimulates response elements (ISRE) in the promoters of ISG to regulate their expression (reviewed in Reference 2). This method was adapted from InvivoGen to specifically detect and quantify IFN-α/β secreted in response to virus infection. HEK-Blue™ IFN-α/β cells were generated by stably introducing the human STAT2 and IRF9 genes into HEK293 cells to obtain a fully active type I IFN signaling pathway. The activation of this pathway is made detectable by the addition of a reporter gene expressing a secreted embryonic alkaline phosphatase (SEAP) under the control of the ISG54 promoter. ISG54 is a well-known ISG activated through an ISRE-dependent mechanism by type I IFNs. HEK-BlueTM IFN-α/β cells were maintained in DMEM containing 10% heat-inactivated FCS, 50 U/ml penicillin, 50 μg/ml streptomycin, and 100 μg/ml Normocin in a humidified incubator at 37 °C under 5% CO2. HEK-BlueTM IFN-α/β cells should not be passaged more than 20 times to remain fully efficient. HEK-BlueTM IFN-α/β cells should be maintained with two selective antibiotics, Zeocin (100 mg/ml) and Blasticidin (30 μg/ml). Do not use selective antibiotics for the test procedure. Cells should be passaged when a 70-80% confluency is reached. Add 50 µl of each sample per well of a flat-bottom 96-well plate. If infectious virus is present in the collected samples, it should be inactivated using UV cross-linker for 5 min at 1,000 μJ/cm2. The sample of the 96-well plate with standards, samples and negative controls (see next steps for the details). “Mock” indicates the same amount of media, but from uninfected cells. “Neg.c.” indicates negative control and described below. 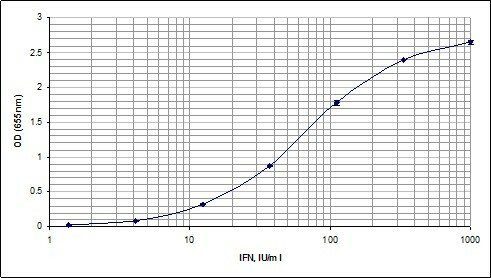 Add 50 µl of IFN-α or IFN-β dilutions (1-8). Transfer 25 µl to each next well to make 1:3 dilutions as demonstrated in the table above. To prepare the dilutions, use the same DMEM as for the maintenance of HEK-BlueTM IFN-α/β cells (no selective antibiotics needed for this step). Suggested negative controls: (1) 50 µl of IFN-γ at 104 U/ml in one well, (2) 50 µl of UV-inactivated medium from virus infected IFN-α/β-negative cell line (like BHK-21) with titer of virus similar to samples used in the same experiment. Prepare suspension of HEK-BlueTM IFN-α/β cells at ~280,000 cells per ml in test medium (DMEM containing 10% heat-inactivated FCS, 50 U/ml penicillin, 50 μg/ml streptomycin, and 100 μg/ml Normocin). Add 180 µl of cell suspension (~50,000 cells) per well. Incubate the plate at 37 °C in a CO2 incubator for 20-24 h.
Prepare QUANTI-BlueTM reagent following the instructions on the package. Add 180 µl of resuspended QUANTI-BlueTM reagent per well of a flat-bottom 96-well plate. Add 50 µl of supernatant from induced HEK-BlueTM IFN-α/β cells. Incubate the plate for 1-3 h at 37 °C in CO2 incubator. Determine SEAP levels using a spectrophotometer (Tecan Sunrise plate reader) at 620-655 nm. Calculations should be performed using plots drawn separately for each range of obtained values. Please note that the curve is not linear and IFN values should be within the detection range, otherwise use dilutions of initial samples. Note: manufacturer recommends using 20 µl of sample volume (day 1) and 20 µl of supernatant (day 2), but we found that increased volumes (50 µl) improved the reproducibility of the results. It is critical to prepare an adequate number of frozen stocks at early passages. HEK-BlueTM IFN-α/β cells should not be passaged more than 20 times to remain fully efficient. HEK-BlueTM IFN-α/β cells should be maintained in growth medium supplemented with the two selective antibiotics, ZeocinTM (100 mg/ml) and Blasticidin (30 μg/ml). Antibiotic pressure with Blasticidin is required to maintain the plasmid coding for human STAT2 and IRF9 genes, and ZeocinTM is required to maintain the plasmid coding for SEAP. This protocol was published in the original paper by Lulla et al. (2013). This work was supported by Estonian Science Foundation grants 7501, 7407, and9421; target financing project SF0180087s08; and the European Union through the European Regional Development Fund via the Center of Excellence in Chemical Biology. Lulla, V., Karo-Astover, L., Rausalu, K., Merits, A. and Lulla, A. (2013). Presentation overrides specificity: probing the plasticity of alphaviral proteolytic activity through mutational analysis. J Virol 87(18): 10207-10220. Randall, R. E. and Goodbourn, S. (2008). Interferons and viruses: an interplay between induction, signalling, antiviral responses and virus countermeasures. J Gen Virol 89(Pt 1): 1-47. How to cite: Lulla, V., Merits, A. and Lulla, A. (2014). IFN-α/β Detection Assay Using Sensor Cell Lines. Bio-protocol 4(10): e1130. DOI: 10.21769/BioProtoc.1130.